As a user of desktop Linux distributions, both at work and at home, I’m often trying to promote the use of Linux-based systems such as Ubuntu. Systems such as Linux to often seen to be only for the most geeky or technical minded of people, whilst Windows or Mac are heavily promoted as being used for everyday, family orientated purposes. This can be as complex as managing home finances and budgets with a spreadsheet application such as Microsoft Excel or the more simple managing of your family and friend’s photographs with some kind of photo album software. Linux systems, such as Ubuntu, have plenty of tools available for spreadsheets and budgeting and the more complex home productivity. For budgeting, there are spreadsheet application such as Gnumeric Spreadsheet, KSpread and the more well known OpenOffice.org spreadsheet application, Calc. This is all very well and good, but what about the simpler, nicer and frankly muchc more things in life like grabbing, tweaking and showing off your friends and family photographs. Well, there are certainly quite a variety of Linux photo album applications available out there. In case you are thinking of moving to Linux, or are just curious about the available Linux based photo management applications, I have put a few details about the best of the bunch below. First up is F-Spot. 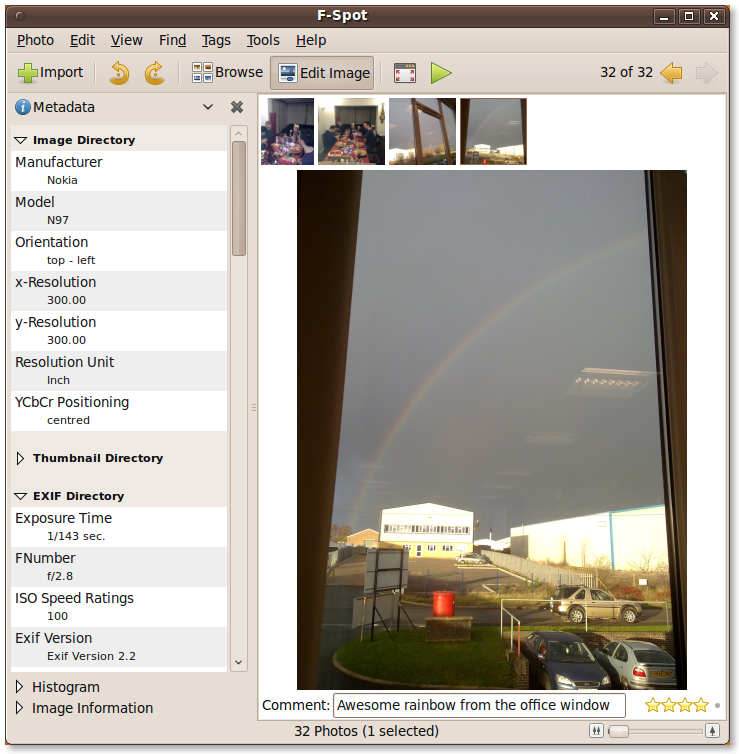 F-Spot is one of the top open-source Linux photo albums. It allows you to import your photos from anywhere – your camera, your phone, a CD, DVD, USB drive or even images you pull from the Internet. Take a look at the screenshot of F-Spot below. As you can see from the screenshot, this is an imported picture I took from our office window. Down the left hand side, the view is set to ‘Metadata’ showing all the details which are sneakily embedded in your image files by your camera. As you can see from this information, this photograph was taken with my fantastic Nokia N97 phone’s camera, and even gives advanced photography details such as Exposure Time and ISO Speed Ratings. But F-Spot is not just about these details, it also lets you perform special effects on all your photos, such as cropping, red-eye reduction, desaturation, sepia toning and much more. It also stores a clever history of all changes made in F-Spot so any accidental mess ups can easily by reverted with only a click or two. Of course, F-Spot is a photo album tool, and does indeed allow to you manage entire albums of photos, give them captions, rate them, tag them as favourites, organise by name, date and much more. Overall F-Spot is a very comprehensive tool, which is both easy to use and comes with a great set of features. It also ships with the very popular Ubuntu Linux distribution. Next up is digiKam, which is a professional, open-source photo album management tool. It is primarily designed for the KDE Desktop Environment, but works in essentially all Linux systems. 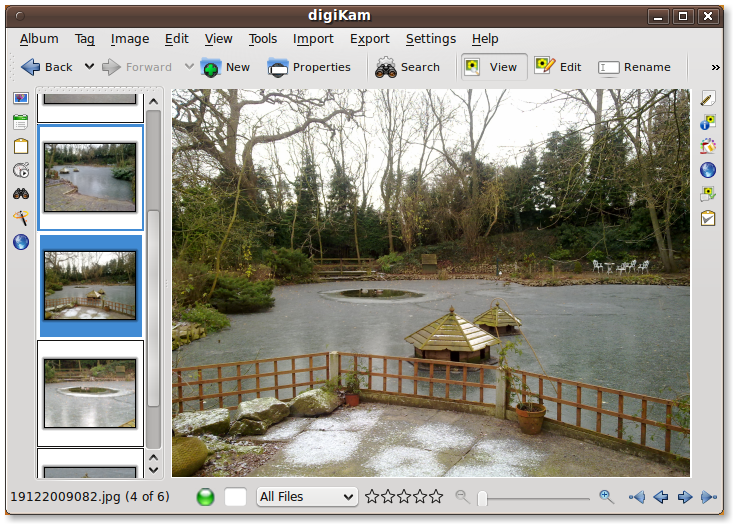 A screenshot of digiKam running on my Ubuntu system is shown below. digiKam is quite a clever photo album management tool, and offers the vast majority of features present in F-Spot. It also allows for filtering by ratings, file types and has a comprehensive pop-out image editor which allows for additional manipulation of photos and the applying of special effects. Renaming of your images in application, searching, adding of captions, ratings and tags and sorting by the physical location photos were taken (via a geolocation service) are also some of the many cleverly supported features. digiKam is, in my opinion, a more professional photo management suite, but its range of features is of such magnitude that it may daunt the non-professional. However, for those wishing to make perfect albums and manage their photographs with intricate details and changes, it is a perfect choice. 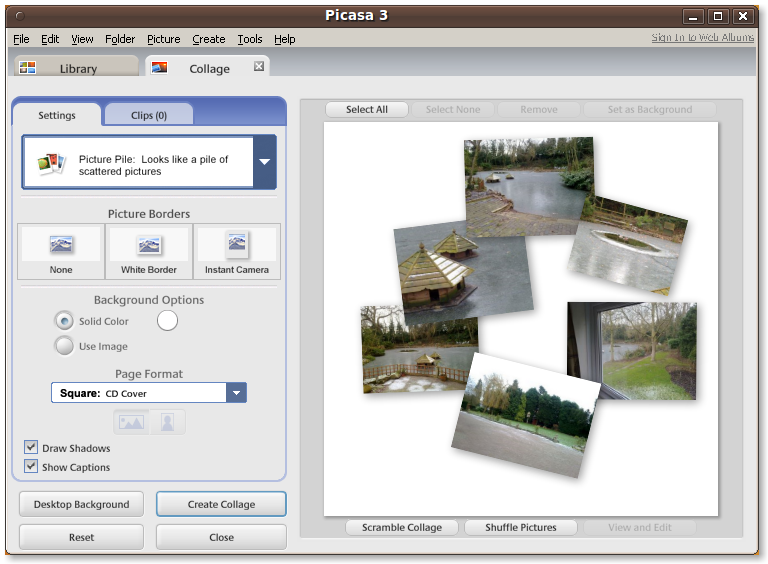 Although not open-source, Picasa is an excellent family orientated image editing tool from a big brand name who you might just have heard of – Google. It is very much aimed at being simple to use, whilst still provided a nice range of features. Along with being user friendly, many of the features have the same aim and are targeting at having fun with your photos. For example, the above screenshot shows Google Picasa 3.0 allowing you to create a collage from an album of photos in many different styles. It is hardly limited to collages however, allowing you to create gift CDs to send to friends, ordering online prints, creating slide-showing and more more in the way of fun and funky features. Picasa is defintely the way to go if you wish be the easily creative and produce stunning creative elements with very little effort. Although fantastic functionality and feature wise, for those who are dedicated to open-source software, Picasa is proprietary and indeed, not a native Linux application but is instead a custom build of the Windows version running under Wine (a Windows compatibility layer for Linux). Although this works very well in most cases and it very fast in terms of performance, sometimes even outstripped the Windows version of Picasa, some users do report issues running Picasa for Linux. However, these issues do seem to be few, far between and usually quite simple to resolve. I hope this quick little guide gives you some good advice on the best of the best in Linux photo album software, regardless of whether you are switching to Linux, looking for an alternative to an application you already use or just stumbled upon this article and have had your curiosity spiked.